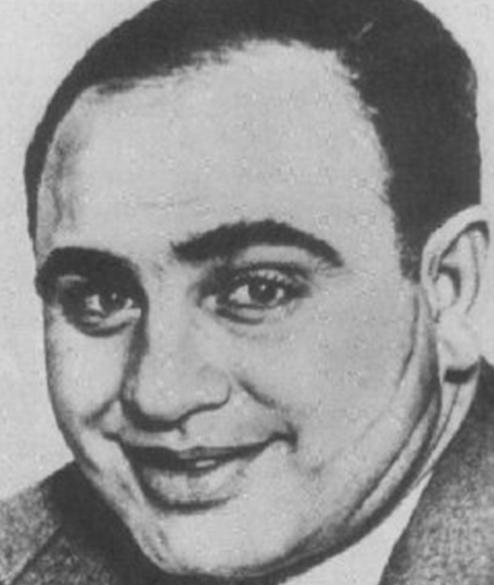 It was June 1931 when the law finally caught up with Al “Scarface” Capone for good. After three years of building a case against Capone for tax evasion, the FBI was finally ready to arrest and try the notorious gangster. In the October of that same year, he was found guilty on five counts of tax evasion between 1924 and 1929, two of which were felonies. He was sentenced to eleven years in federal prison, plus fines. Though Capone “grinned as though he felt he had gotten off easily,” his prison time ended up draining the last healthy years of his life. He was released in 1939 (after spending only seven years in prison), but illness and disease – most notably syphilis – ravaged his mental capacity so much that in the FBI report it said that he had “the mentality of a twelve year old.” He died in 1947 on Palm Island at the age of 48. Here’s the story of how Alphonse Gabriel Capone became Al “Scarface” Capone. Alphonse Capone was born January 17, 1899 in Brooklyn, a middle child in a large Italian immigrant family. His family moved around Brooklyn, in order to make sure they could afford the housing. This contributed to turning an otherwise smart boy (when he actually was in school, he purportedly maintained a B average, which was more of an accomplishment then than now) into one who regularly played hookey and was mischievous. His legendary temper was already apparent at 14, when he hit a teacher that he thought was unfairly lecturing him. He officially dropped out of school soon after, like several of his brothers. He took a few honest jobs – at a candy store, pin boy at a bowling alley, and a cutter at a book bindery – but that didn’t last long. At 15 or 16 years old, Al joined his first gang, the South Brooklyn Rippers. Quickly after, he was initiated into a more prestigious gang, the Forty Thieves Junior – a junior version of the notorious Five Points Gang. A later version of the mostly Irish gangs of Five Points that was depicted in the 2002 film Gangs of New York, the Five Points Gang was primarily made up of Italian-Americans and led by Paul Kelly. Born Paolo Antonio Vaccarelli- he changed his name to Paul Kelly in order not to seem so Italian- Kelly was a charmer, a tough guy, and quite a skilled boxer. In fact, he was such a good prize fighter that he earned enough money to open his own businesses – mostly brothels and gambling houses. His establishments were often frequented by Tammany Hall politicians. Soon, him and his boys were “campaigning” for Tammany Hall candidates, making sure the right people got elected. In 1903, Kelly was arrested for assault and robbery, serving nine months in jail. Upon his release, he opened the Paul Kelly Athletic Association, a gym or club for youngsters to learn how to box and fight. This is how Kelly and his cohorts recruited the next generation of gangsters, like Meyer Lansky, Bugsy Siegel, Frankie Yale, and Al Capone. It was Frankie Yale who recruited Capone to the Five Pointers. Six years older than Capone, Yale was known to engage in a fight or three, most famously when he and a buddy “cleaned out” a Coney Island pool hall with only a pool cue and a few billiard balls. Besides fighting, Yale was in and out of trouble with the law through his late teens. But like Kelly before him and Capone after, Yale knew the key to being a great criminal was being a good businessman. He got himself involved in the ice business (yes, in a time before everyone had freezers, ice was big business), selling “protection” to icemen and enforcing territories. He made enough money to open a bar in Coney Island, he called Harvard Inn – as a play on his own college-themed name. He hired Capone to work as a bouncer at that inn. Harvard Inn was strategically placed, even though when Yale opened it in 1917, he didn’t know it yet. Located in an alley between Surf and what would become Boardwalk, Harvard Inn had exclusive access to the water – making it one of the first bars to serve liquor from the “coastal rum-runners” during Prohibition (which began three years later, in 1920). Yale, who by 1917 was already rather successful with the Harvard Inn, a mortuary, betting on prizefighters, and a line of cigars, would become extremely wealthy due to his good luck and well-positioned bar. Being a bouncer at Harvard Inn required a “certain finesse,” according to Robert Schoenberg’s book Mr. Capone. They had to do it with tact and authority, but not too much that the customer didn’t want to come back. Capone was quite good and besides becoming his bouncer, Capone became Yale’s pupil. Yale considered himself a businessman first, not a thug or a criminal. Sure, he extorted, “protected,” and racketed, but that was just part of business. If he needed someone beat up or even killed, he would never do it himself – he would hire someone. In Capone’s early days in the industry, he often played this role, in addition to being a bouncer. When Capone became the boss, he adhered to this strategy as well. Yale was also quite brutal, with the legend being that he beat his own 16 year old kid brother so badly for lying to him that his brother had to go to the hospital. Capone also picked up on this as well. New York City was experiencing a heatwave in early August of 1917. To escape the heat, many came to Coney Island to play in the water and sleep on the cool beach at night. For this reason, it was as crowded as Coney Island had ever been. And Harvard Inn, due to its location, fans and cold drinks, was packed every day of this heat wave. This brings us to how Al Capone got his famous scars. On one particular day during this time, a small stocky “hood” named Frank Galluccio sauntered into the bar with his date, Maria Tanzo, on one arm and his younger sister, Lena, on another. Despite the crowds, Capone, who was 18 at the time, honed in on Lena. Watching from afar, he finally got up the nerve to talk to her, asking her to take a walk with him along the beach. She supposedly said no and Capone walked away, but that didn’t stop him from continuing to watch her. Hearing this, Galluccio demanded an apology from Capone for the remark. Capone wasn’t having it, telling Galluccio he was only joking around. This is when the situation got dicey. You see, Galluccio was only five foot six and slight of build and was now attempting to defend his sister’s honor by going toe to toe with the five foot eleven, very beefy Capone. Being at something of a disadvantage physically, Galluccio decided to escalate the situation beyond fists and pulled out his knife, slashing at Capone, and managing to get in three cuts to Capone’s face and upper neck before Capone went down. With Capone on the ground in a pool of blood, Galluccio ran out of the Harvard Inn. Galluccio, thinking this was the end of his life, tried to plead his case. But Yale never had any intention of hurting or killing Galluccio. He was a businessman and simply wanted to profit from this unfortunate scenario. He ordered that Galluccio pay Capone $1,500 for his trouble (about $27,000 today). In return, Capone had to promise never to retaliate. To top it off, Yale would lend Galluccio the money, making Galluccio indebted to Yale and earning interest to boot. Galluccio and Capone both agreed to this and the matter was settled. Throughout his life, Capone would usually claim his scars were acquired fighting in France during World War I. He rarely owned up to the fact that his nickname came from a bar fight when a smaller man slashed his face for making rude comments to his sister. Please, Please PLEASE, have a proofreader and/or editor go over the posts on this site. “Him and his boys” ? Really? Would you like the title? I’m sure they’d be happy to have a volunteer editor. If you’re feeling SUPER generous, I’m sure you could find a place to donate to the hiring of an editor. Cheers! This article was very helpful but I do agree with Jim you could make it grammatically correct.